This post is going to serve as much as a question mark as anything - a mostly blank space to be hopefully filled out in future. 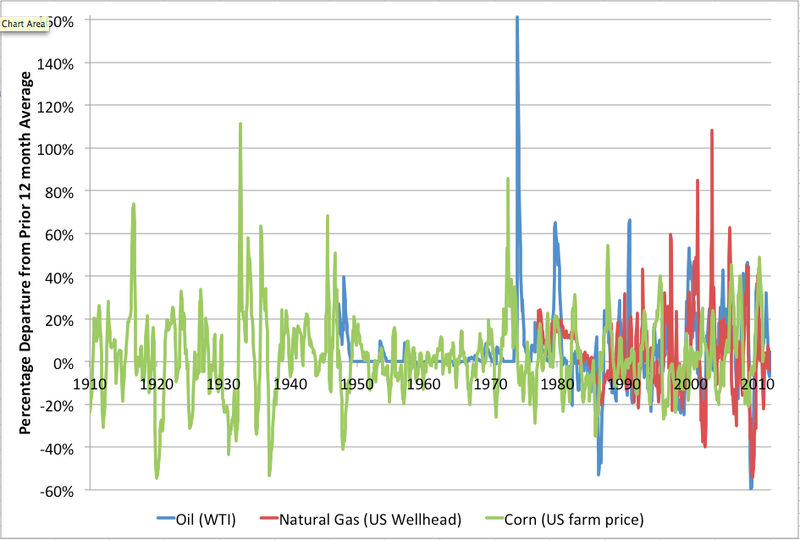 I was curious about the relative volatility of different commodity prices. I intuitively expected that oil would be uniquely volatile between the very low elasticity of demand and the geopolitical problems with supply. 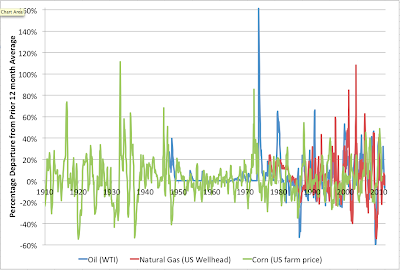 The above graph shows - so far - three commodities - corn, oil (WTI) and US natural gas. In each case I am plotting the relative departure of the current month from the average of the prior twelve months as a simple but reasonable normalized measure of volatility. In essence this is some kind of measure of surprise - to the extent something happened this month that the market had not already priced in, this month's price will be very different from previous months. I'll try to quantify these things and add a few more commodities tomorrow. In the meantime feel free to add observations or explanations in comments. Plot it against gold for perspective. "The Golden Constant" is a good academic/data driven view of prices. Any chance the relatively benign period prior to the oil shocks reflects a time before the "finacialization" of global markets and the speculation that went along with that? There may have been just as many surprises, but they didn't result in such large price movements.